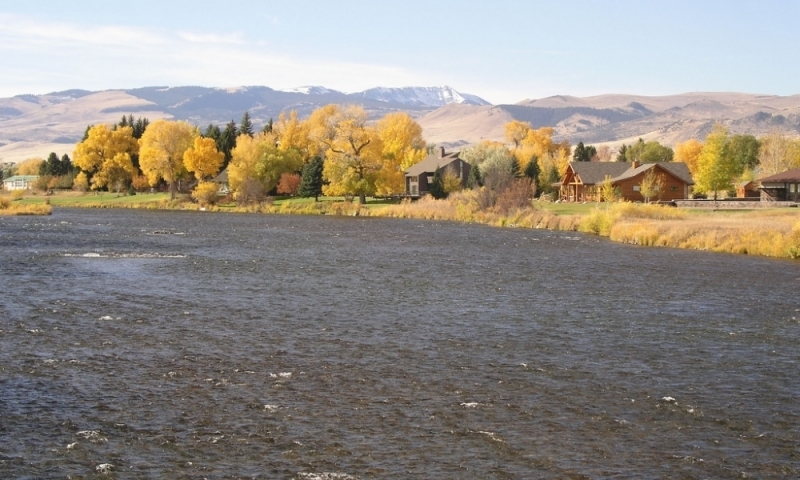 Madison River fly fishing provides much challenge and marvelous scenery to the fisherman who wants an ideal fishing vacation getaway, and who loves catching lots of fish. As our name implies, we are experts on this special and unique river, helping visiting anglers enjoy this beautiful resource. Select from 1/2- or full-day trips. 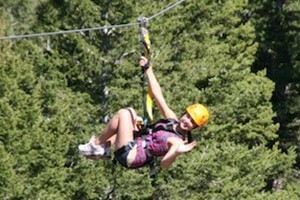 Just 35 minutes from West Yellowstone, offering premium log lodge cabin rentals, sleeping 10-14 each. Private boat dock on Cliff Lake, and close to Madison River fishing. 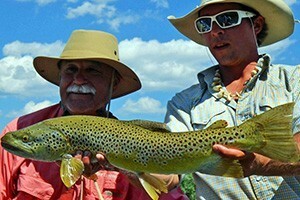 Professional guided fly fishing trips on the Madison River and in Yellowstone National Park. Contact Alice Owsley, Montana Outfitter #9435 for more information and photos. Our clean and cozy motel offers multiple room layouts and bed sizes for all angling groups. Select from full-, queen, king and 3 full-size bed arrangements. The Madison River flows from its headwaters in Yellowstone National Park, through southwest Montana to Three Forks, Montana where it merges with the Missouri River. The river between Quake and Ennis Lakes is the most famous, known as the “fifty mile riffle” in its straight and wide flow. This river holds a steady pace of around 5 miles per hour through much of its travels, except at Bear Trap Canyon where the raging waters are considered too dangerous for most boatmen, and the whitewater in a 3-mile stretch below Quake Lake. Most of the river is very accessible and easy to wade. The rainbows and browns become active and even aggressive in the middle of May as the Madison River begins to fill with snow runoff. And fishing remains great all the way from May to the early part of July, as the Salmonfly hatches occur during this time. Again in September is a good time to fish the Madison, as the bigger fish come out to make their big push for gaining weight before winter comes. The fall is a wonderful time for fishing in Yellowstone, as the fish enter the Madison from Hebgen Lake. Throughout its long journey, Madison River is home to plenty of rainbow trout, brown trout, as well as some cutthroat and cutthroat-rainbow hybrids. 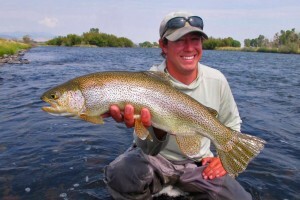 You’ll also find occasional westslope cutthroat trout and mountain whitefish. Madison River fishing is great in Yellowstone National Park. Fishing here for rainbow and browns isn’t for beginners, however, with some technical expertise required with dry fly and nymph. All fishing in the park is fly fishing only and is catch-and-release. 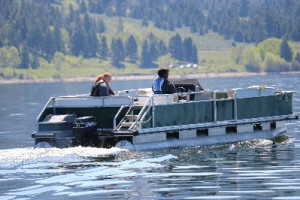 From the Yellowstone Park boundary to Quake Lake is another place that has a reputation among fishermen as a world-class fishery. The river moves from Madison Junction in Yellowstone, past West Yellowstone and into Hebgen Lake. The riffles and runs harbor big rainbows and trophy-sized browns. Below Quake Lake, and a 3-mile whitewater section, the river moves towards Ennis Lake in the journey that is called the “fifty mile riffle.” This stretch of river is known for the best fly fishing on the river and its huge rainbows and browns. There are several access points along Route 287. 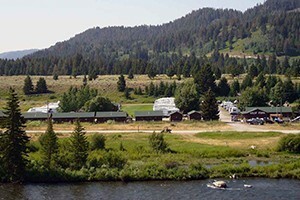 It’s the most advantageous to seek any advice rom the outfitters around West Yellowstone and other towns near the Madison as their experience is phenomenal. Hiring a fishing guide is a good idea, too, so you can really make the most of your trip. The Madison River joins the Gallatin and Jefferson at Three Forks MT to form the Upper Missouri River. Madison River info on our Yellowstone Park website.